Microscope World Blog: Microscope World Launches Blog! Microscope World is excited to announce the launch of its blog. In this area you will find information on microscopes, microscopy and all-things-microscope. 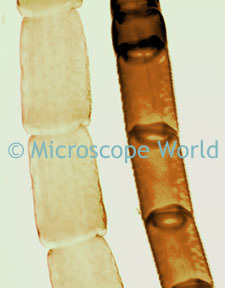 We regularly capture images with the microscope and hope to be able to share these with you as well. 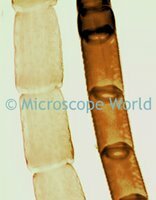 The image at left is an insect antennae under a student biological microscope at 100x magnification. Notice that this antennae was transparent enough to allow the light from beneath the microscope stage to pass through the antennae. If the antennae had been a solid opaque color, you would not have been able to view as many details on the specimen.